You can't celebrate Halloween if you don't scare anyone. 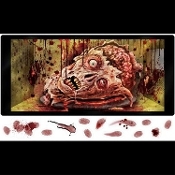 You are sure to scare your friends and family with this Dexter Walking Dead Horror Themed Halloween Microwave Door Decoration Peel 'N Place. *PLEASE NOTE: ***This is NOT a regular window cling...*** more like a wall STICKER with REMOVABLE sticky-back surface, but can be used on windows. The gory bloody head sitting in the microwave will be an unexpected surprise for everyone! Halloween Microwave Door Decoration repositionable sticker grabber cling will add a blood-curdling touch to the rest of your horror decor. You could even add our Creepy Crapper Restroom Door Cover, Dishwasher Demon, or Body Parts Refrigerator cover to complete the scene. ONE 12-inch (30cm) High x 24-inch (60cm) Wide sheet total size. Create the scariest Halloween house on the block! Hang over doorway, window, or drape from ceiling. Great additions to cemetery, graveyard, dungeon, witch's den, mad scientist lab, mad doctor office, horror movie scene, etc. Save the backing paper to remove and re-use next year!